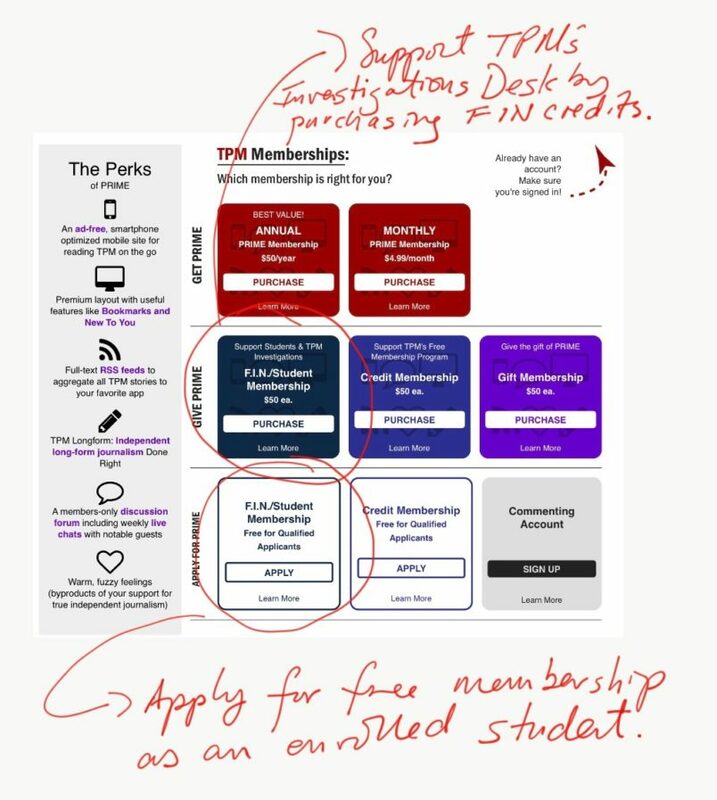 TPM is now officially offering free Prime memberships for all enrolled students. You can be full-time or part-time. You can be in high school, college, graduate school, vocational schools. You just need to be enrolled. As I’ve mentioned a few times, this is part of our new Future Is Now (FIN) program. It creates free student memberships and more money for TPM’s Investigations Desk team. Readers can purchase $50, $100, $1000 worth of FIN credits or any number in between in $50 dollar increments. Each credit creates an annual free membership for an enrolled student. In turn we take 100% of the money from that credit and commit it to salaries, benefits and other costs directly tied to the TPM Investigations Desk, our expanding muckraking and investigative reporting team. We have already budgeted a third member of the iDesk team who we are currently hiring for. But we want to do more. A lot more. The FIN program will help us do just that. Over the years and especially during the last six months or so we’ve had a number of people write in to say, I’m already a Prime member, but I’d like to contribute more. This is how you can do that. So are you a student who wants to sign up? Or a reader who wants to purchase FIN credits? Here’s how. If you’re not a member or not currently logged in, look at the top right of the screen and you’ll see a red Prime logo. Click that and then click “join prime”. That will bring you to this page pictured below. If you’re a current member and logged in, click here. As you can see, we’ve dramatically upgraded the whole Prime sign up interface. I’ll talk about that in a subsequent post. But for either getting a free membership or purchasing FIN credits to support TPM’s original investigative reporting, just click on the two blocks I’ve highlighted and it’s pretty straightforward from there. As you can see we’re only starting this now. And we need a FIN credit for each free membership we give away to a student. But we’ve already stockpiled a good number of offline commitments. So on day one we have plenty of student memberships to go around. So if you’re an enrolled student, we’d love to welcome you aboard. Let’s do this.